Inkcups showcased six promotional printing systems, including live demonstrations on the Helix, B100 and Cobalt 2000, at the PSI exhibition. The Inkcups booth featured three digital printers, including the patented X2, Xjet and Helix. 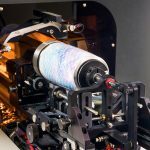 The Helix is a 360-degree digital inkjet printer for straight-walled and tapered cylinders that prints full CMYKWW+V on cylindrical items such as sports bottles, mixing glasses, barware, candles, stainless steel tumblers and more. The system uses smart software with automatic height adjustment and intelligent diameter measurement for greater accuracy and precision. Inkcups demonstrated how the Helix consistently reproduces high-quality, durable text and images onto plastic cups. The booth also displayed the Xjet industrial UV LED inkjet printer designed for both short-run and long-run industrial printing. This printer produces a 500 by 620-millimeter area print in 90 seconds and handles parts up to 5.75 inches tall. This high-speed and low-cost innovation combines premier XY flatbed scanning systems with high-production capabilities. Another demonstration at PSI focused on printing on plastic promotional items using the B100, a high-speed, single-color tabletop pad printer suitable for printing on promotional products, as well as tagless garments, glassware and medical and electronic devices. In addition, there was a live plate-etching demonstration using the Cobalt 2000. Lastly, Inkcups unveiled its new MagiCoat, a water-based ink primer that optimizes adhesion, enabling glassware to withstand up to 600 industrial washes without image degradation, depending on type of glassware, detergent used and temperature of wash.